Do you enjoy viewing paintings by the masters such as Rubens, Michelangelo, and Vermeer? Most people, whether they are art aficionados or not, can connect with these painters, since their style of rendering the figure is very life-like. What about Picasso, and the style of Cubism? I smile when I hear people who are not trained in the arts say, “I can do that.” And “This painting is not pretty.” But for those who fully understand the intent of a Cubist painter, that changes everything. They understand that Cubism is about multiple perspectives, meaning that it fuses the past and present, and different views of the subject at the same time. For a piece to be successful in direct mail you need to look at past, present and future simultaneously. From the past, you need to analyze the data of what worked and what didn’t. In the present, you plan the timing of the mailing, and how to get someone to open the envelope and respond. For the future, you need to think about how to retain that person for future purchases or fundraising efforts. In the Cubist painting above, notice the face is rendered in different perspectives. The lips and eyes are drawn as if you are looking straight at the person, but the nose and ears are in side profile. Direct mail requires you to look at different angles also. Angles such as — Who is your audience? What is the goal of the mailing? If it’s for marketing a product or service, what are the benefits and offer, while for a nonprofit, it’s what would make someone feel as if they are making a difference? When you take this Cubist approach, you too can become a master — a master of direct mail. 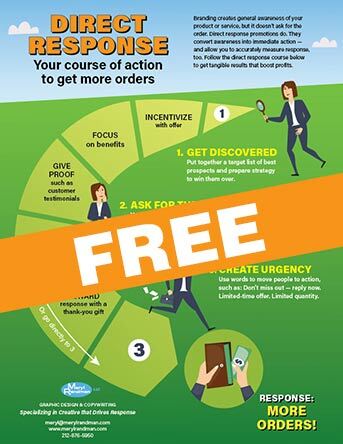 FREE INFOGRAPHIC See the components of an effective, response-driven creative. FREE when you sign up for my quarterly newsletter.